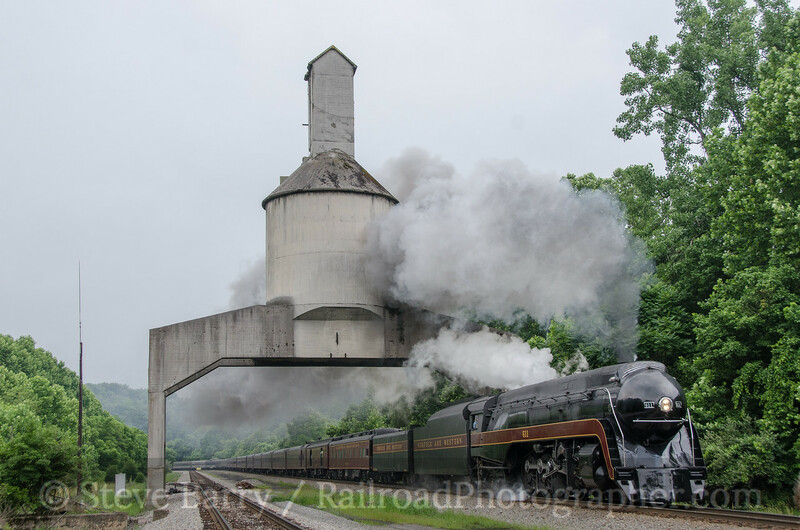 In our last post we explored the former Norfolk & Western mainline east of Roanoke, Va. 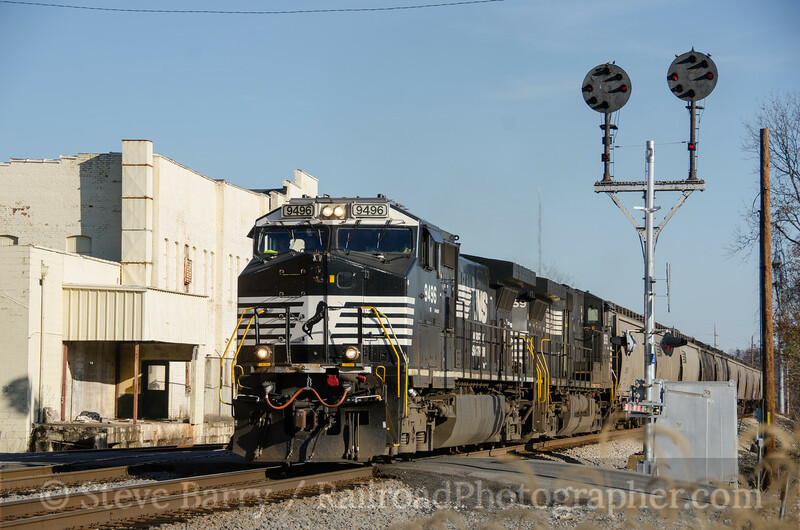 The line is now operated by Norfolk Southern, but still features some uniquely N&W characteristics. In this post we are going to flash back to July 2015 (just a few months ago) when a very special visitor was on the line. 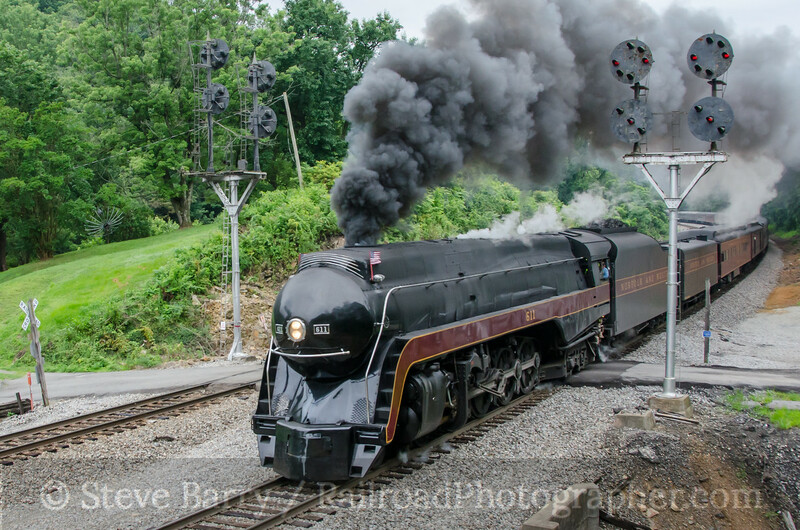 The Virginia Museum of Transportation and Norfolk Southern teamed up to bring N&W J-Class No. 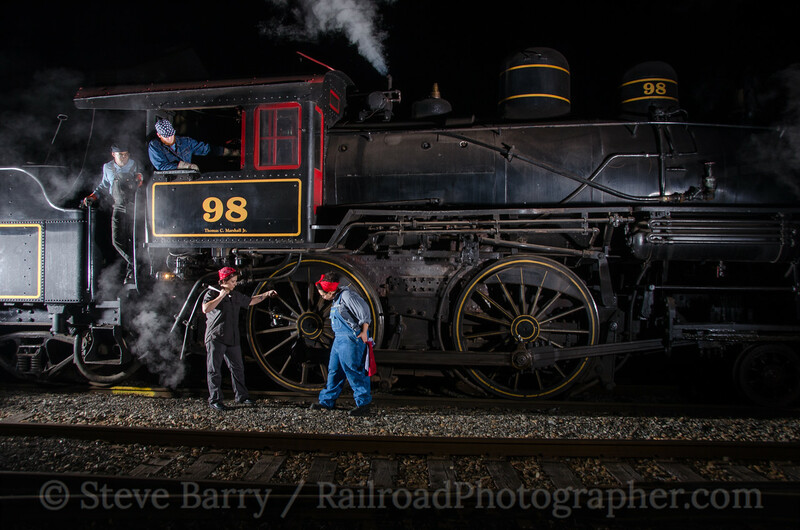 611 back to mainline rails for the summer. 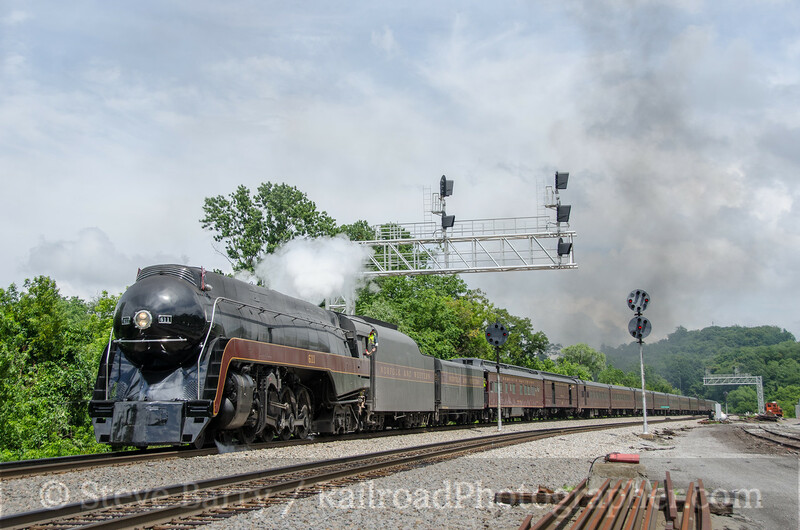 The big 4-8-4 ran trips out of Alexandria and Lynchburg in Virginia, but the red letter trips were six that were run over the Fourth of July weekend -- trips that took No. 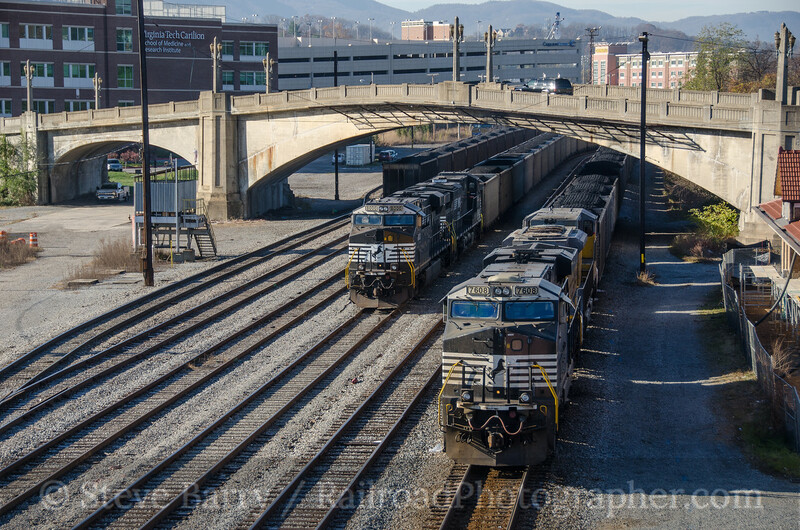 611 back to its old home rails out of the city it was built in, Roanoke. By steam locomotive standards, No. 611 is not old. 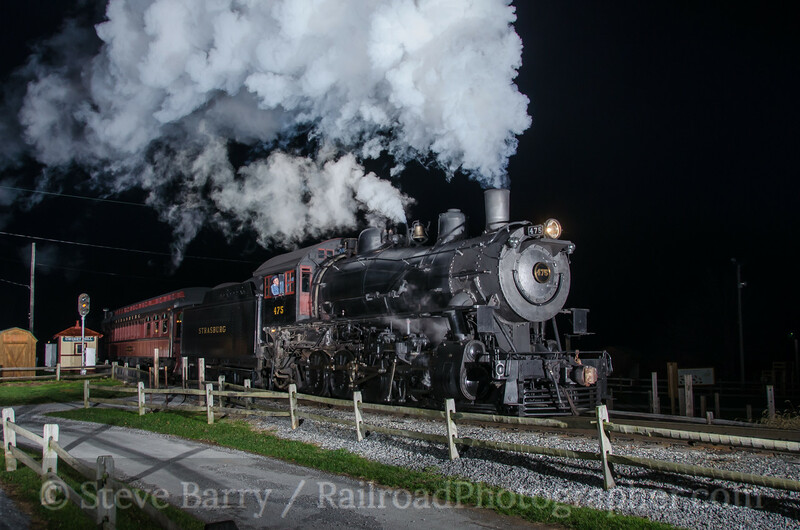 It was constructed by the N&W in Roanoke in 1950, and by 1959 it was retired. In the early 1960s it was donated to the Virginia Museum of Transportation and displayed throughout the 1970s. 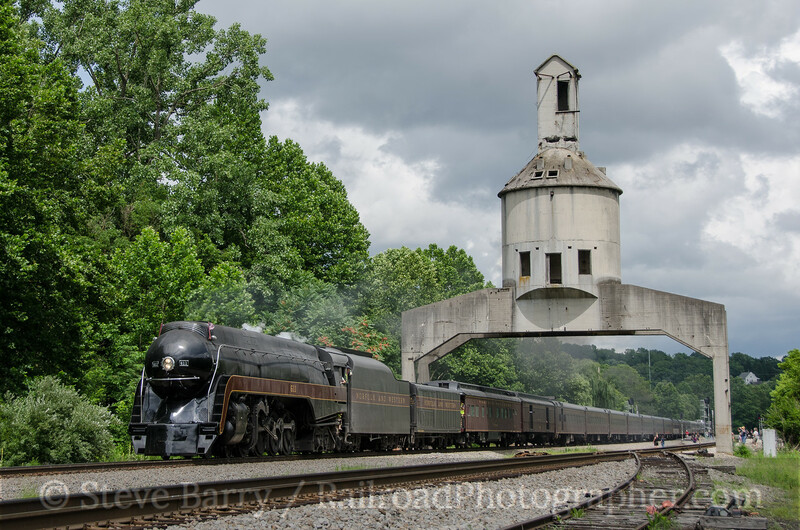 In 1982 it was restored to take part in the original Norfolk Southern Steam Program, and powered the last trip for the program in 1994 before returning back to VMT. 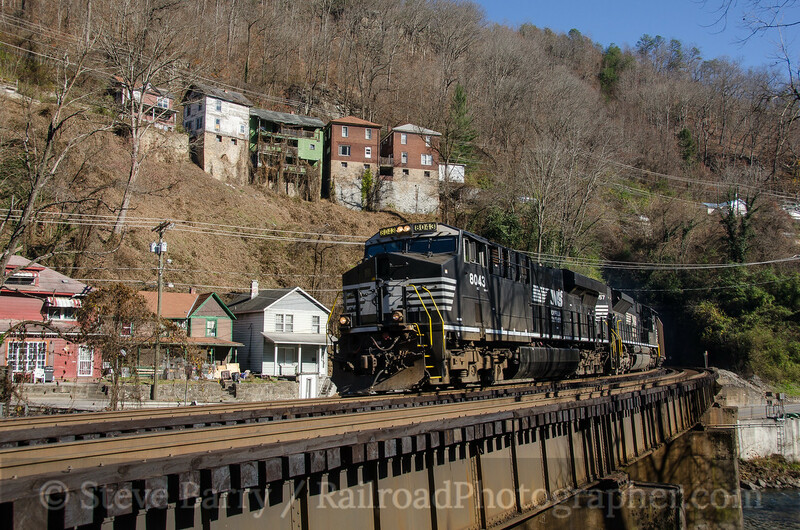 Norfolk Southern started the 21st Century Steam program in 2011, and the Fire Up 611! campaign started in 2014 to raise funds to have 611 join the program. It made its earlier this year. 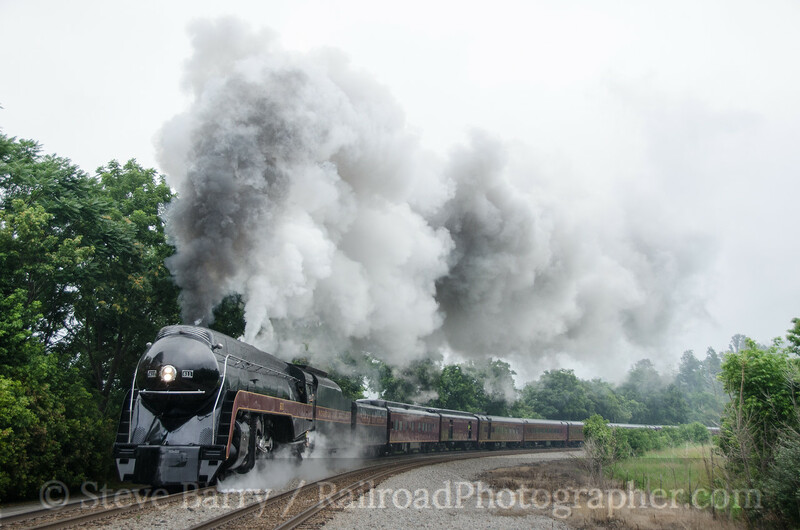 When the Roanoke trips were announced, I knew I had to get down to Virginia for the trips. Each day over the long weekend No. 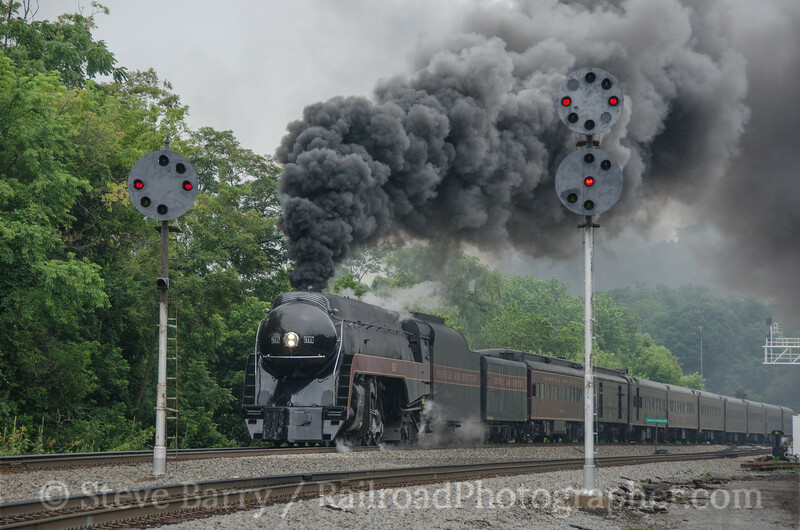 611 would power two trips -- a morning trip from Roanoke to Lynchburg and return over Blue Ridge Summit and an afternoon trip from Roanoke to Walton over Christiansburg Hill. It was going to be a great weekend. 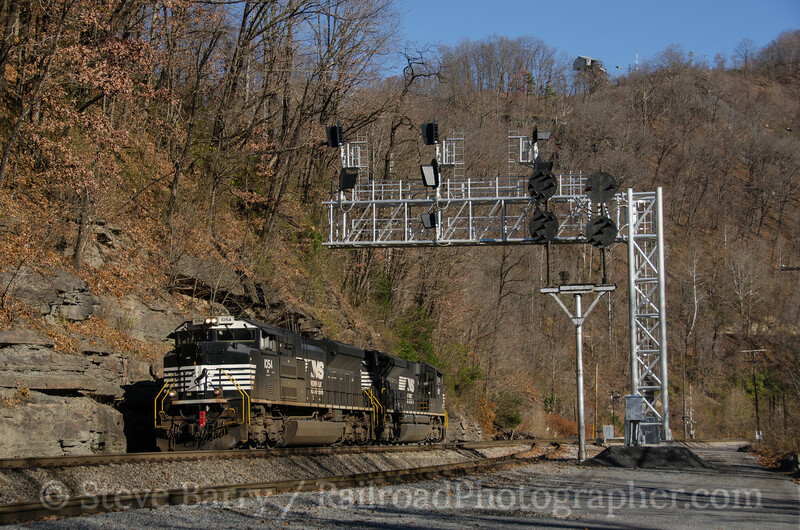 Both lines have a lot of Norfolk & Western era color position light (CPL) signals, especially east of Roanoke. 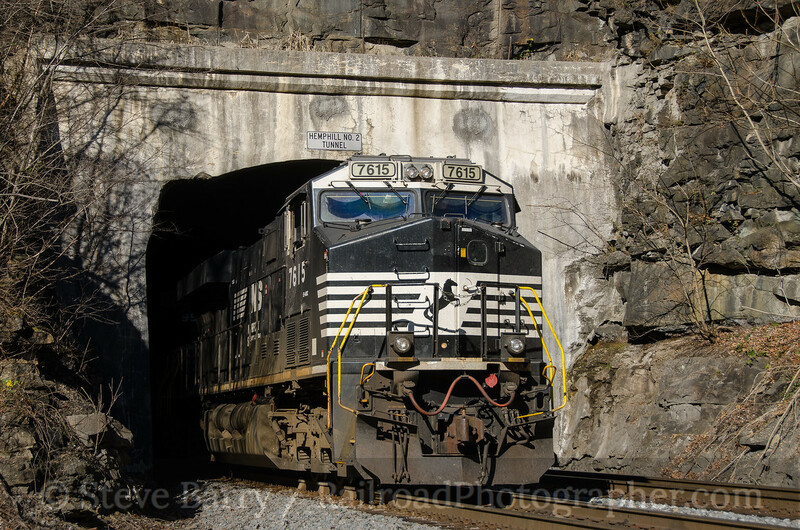 These are being replaced by more modern technology as railroads install Positive Train Control on their routes. I knew there would be crowds down in Roanoke chasing the trips, just as I was, but I wasn't expecting quite that large of a crowd! 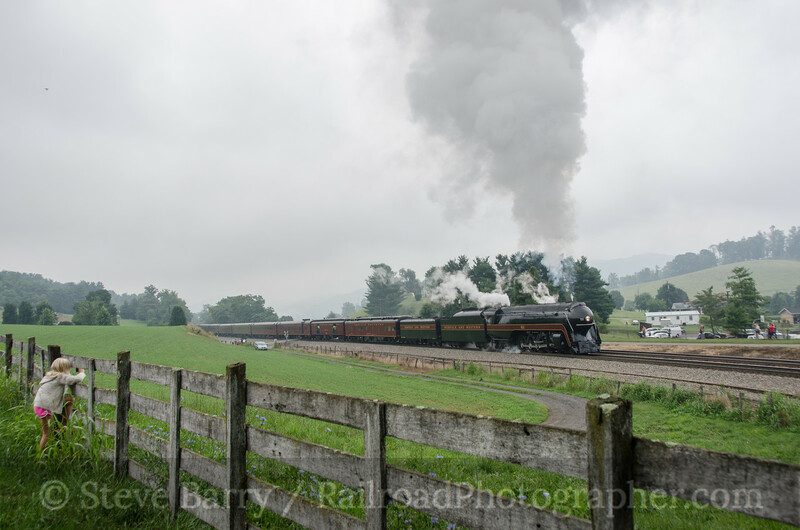 On the first day, July 3, the Blue Ridge Parkway bridge over the N&W near Bonsack must have had 100 people on it. Cars lined the roads along the tracks through Webster. 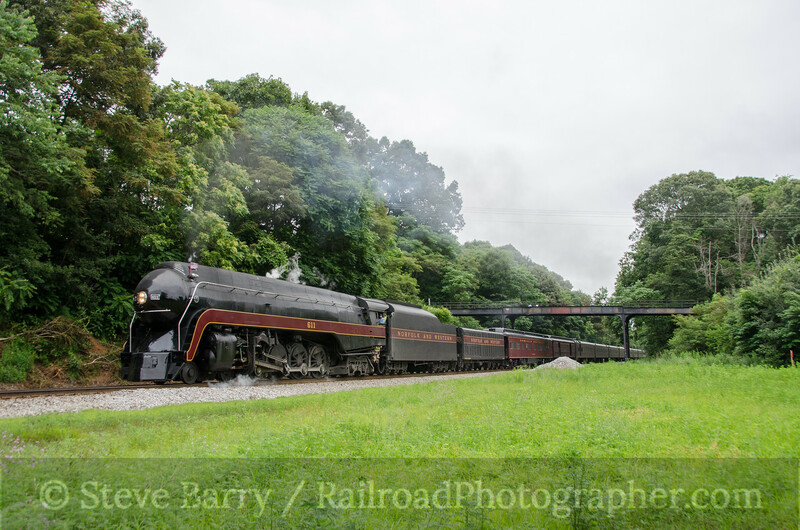 We caught the train at Webster, then went ahead to Forest, near Roanoke for a shot. Forest has a nice CPL signal, so after the train went by heading east a few of us started organizing a photo line for the westbound trip, which made for a nice photo. 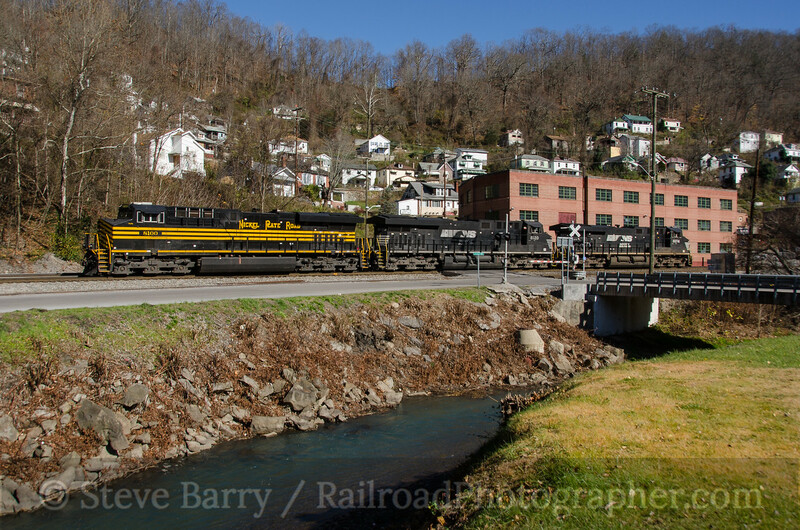 After the stop in Roanoke, we headed west for the Walton portion of the day, pausing at Riverside near Elliston. 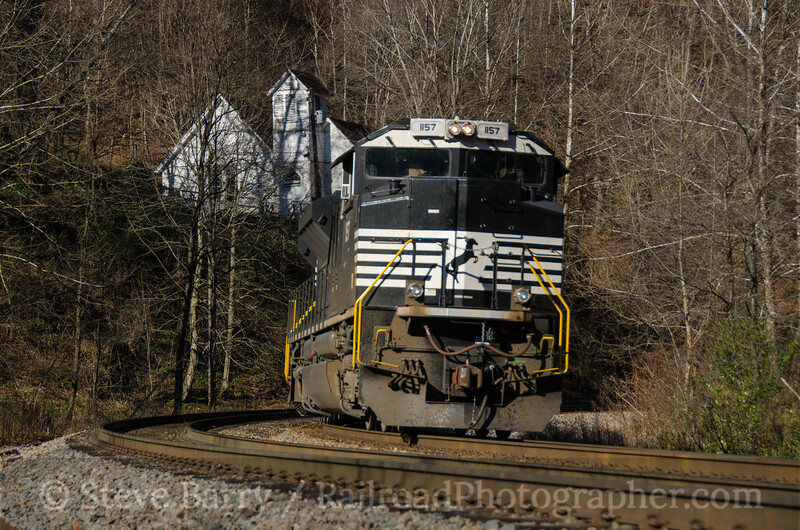 Wet rail and a heavy train had 611 working hard as it blasted past us on a nice curve. 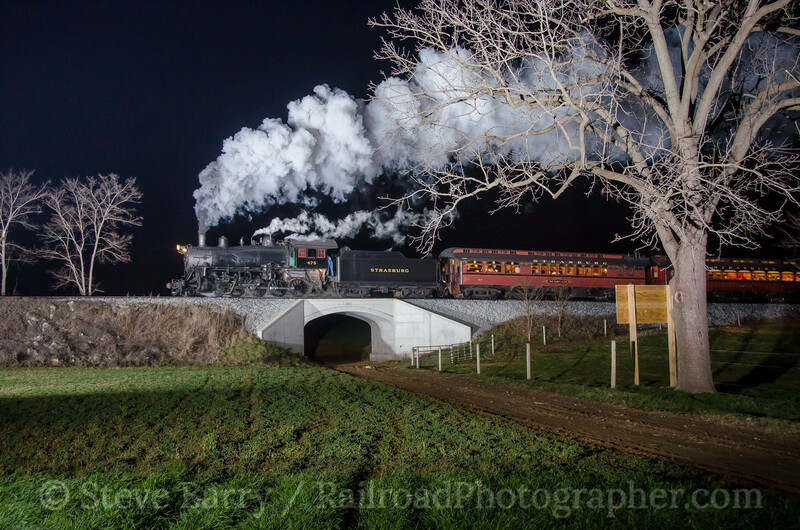 The train had slowed down considerably thanks to the grade, and that allowed just about every chaser to congregate in Shawsville. While the photo doesn't show it, there were several hundred people in the small town to watch the train pass through. It only went through at about five miles an hour, thanks to the grade and wet rail. The slow speed allowed us to get ahead of the train again. 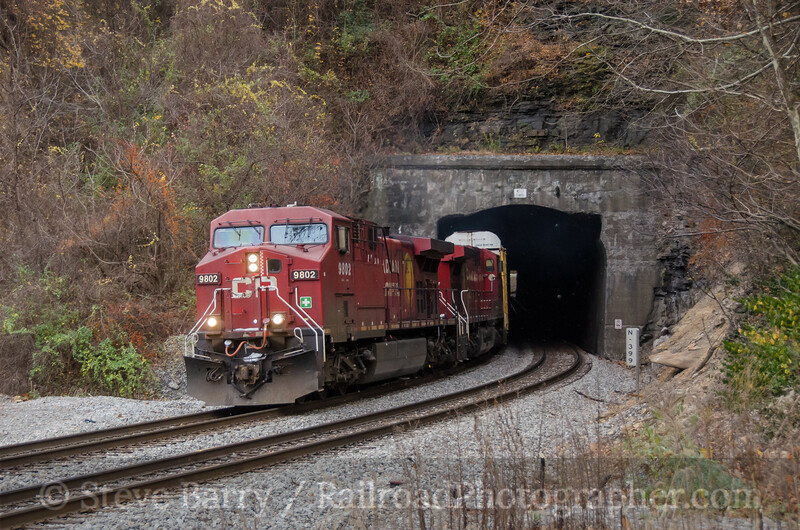 Montgomery Tunnel, a classic N&W location, was under construction for a clearance project, so we bypassed that and headed for the CPL signals in Christiansburg. 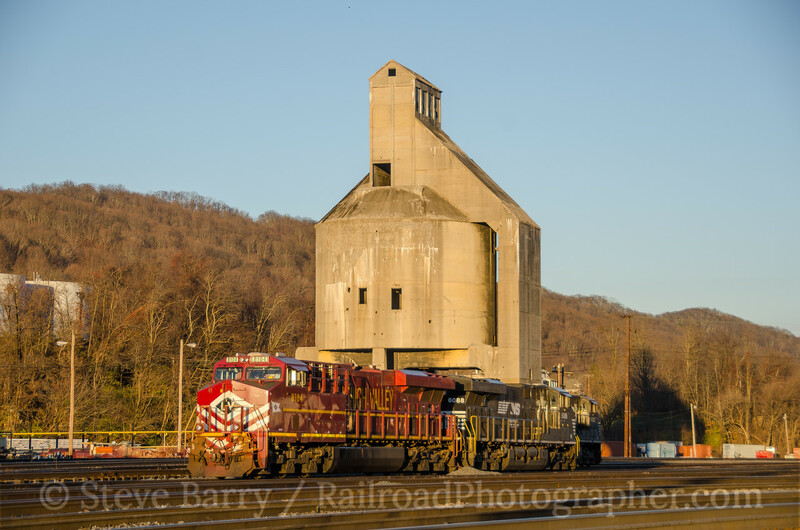 After the train turned at Walton, we caught it coming under the old N&W coaling tower at Vicker (top photo of this post). Fading light at this point encouraged us to call it a day. The next morning found us at the CPLs at Montvale for the Lynchburg run. The sun was out, then went back under a cloud. 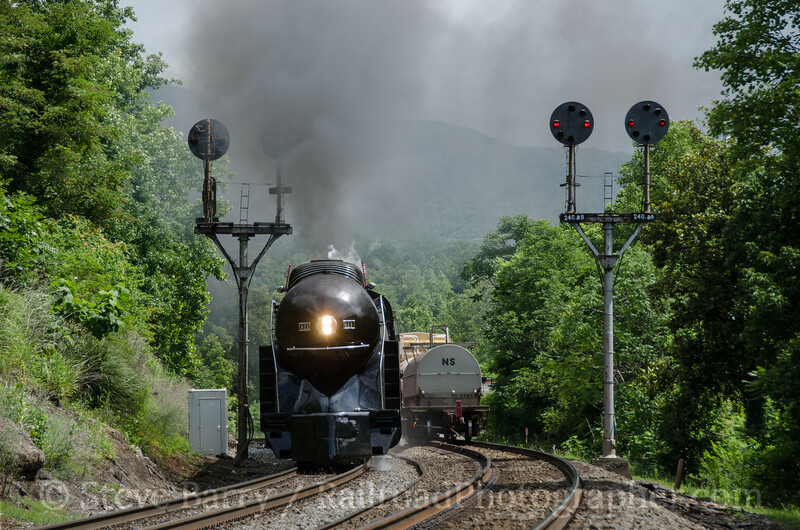 We could hear 611 approaching as it tackled the Blue Ridge grade, and we thought we were skunked. 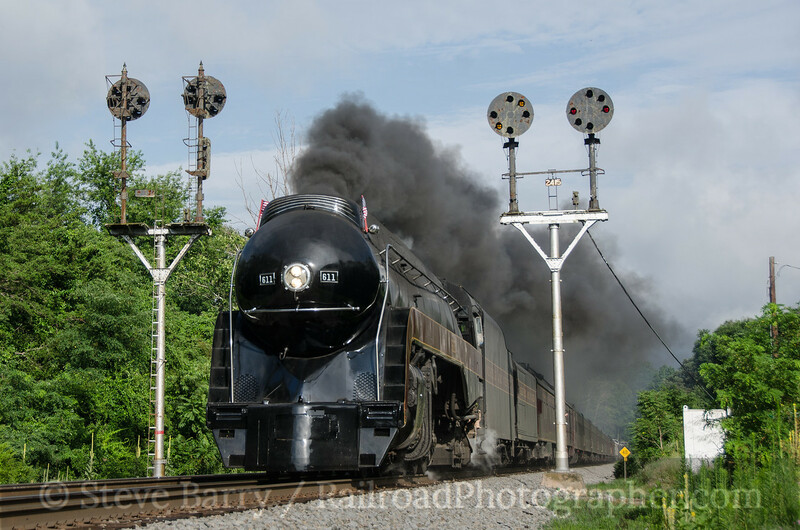 But amazingly the cloud cleared about 20 seconds before the train's arrival and we got 611 splitting the signals in fantastic morning light -- probably the shot of the trip. From here we negotiated the outskirts of Bedford and made it to the overhead bridge in Lowry with just a couple of minutes to spare. 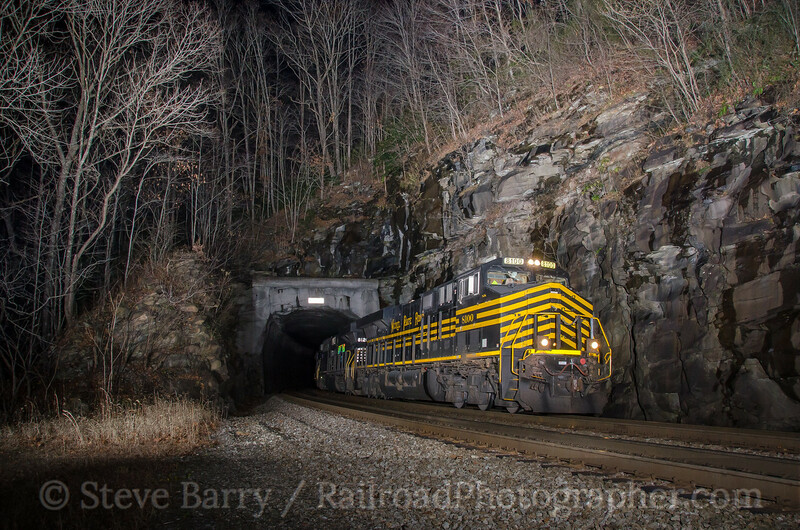 From here we headed back west towards Roanoke to set up for a shot on the "must do" list -- passing the CPLs at Blue Ridge. Blue Ridge requires a bit of a hike to get into, and is almost in the middle of nowhere. Imagine our surprise when we got to the signals and found 30 other people already there! 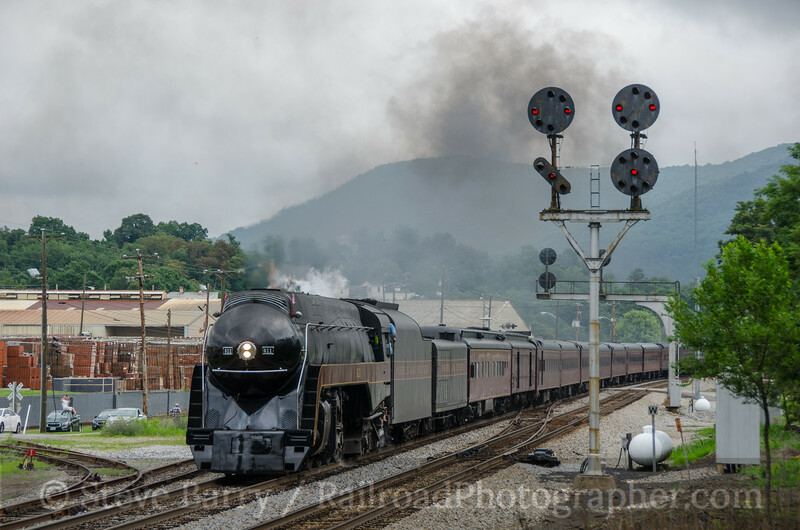 There were some anxious moments, though -- as we were monitoring 611's return from Lynchburg via cell phone from others along the route, a slow freight train came out of Roanoke and trundled upgrade on the track between us and where 611 would be. 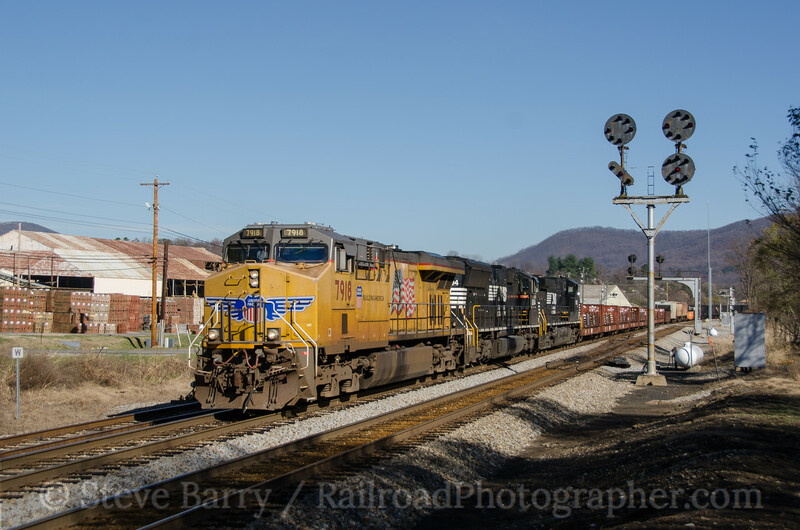 Eventually we could hear 611 whistling as it got closer, but the freight just kept on coming. 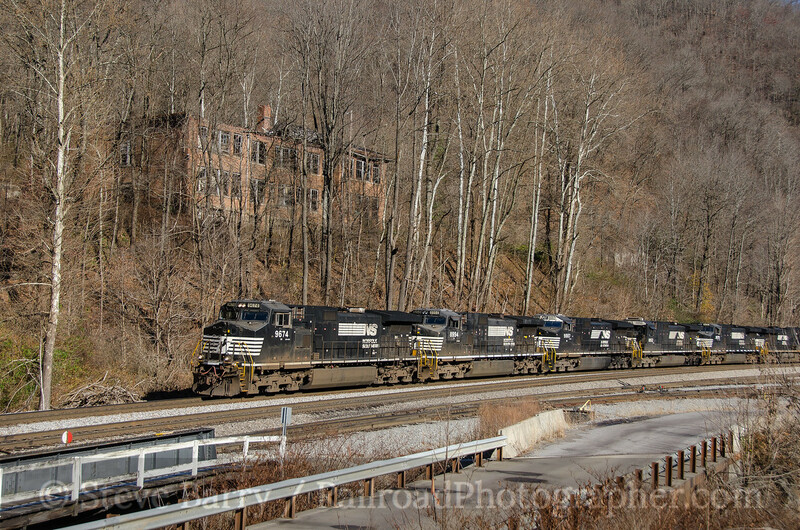 Finally, the last car of the freight went by and less than 30 seconds later 611 came flying down the hill. 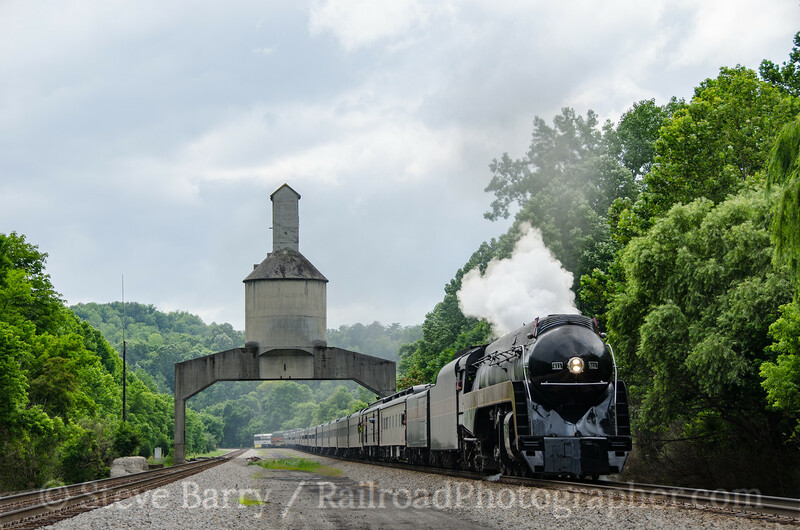 From here we headed for another shot on the "must do" list -- westbound at the coaling tower at Vicker. 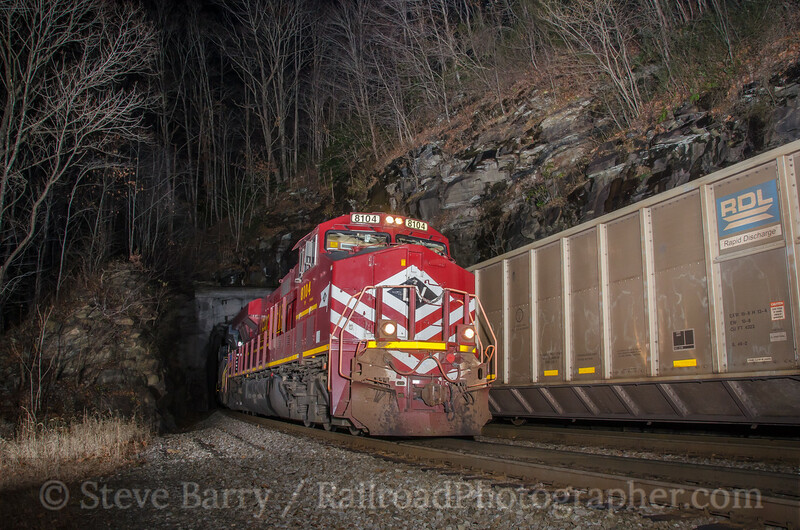 Despite being distracted by some freights on the former Virginian Railway that parallels the N&W, we arrived at Vicker in plenty of time for the shot. 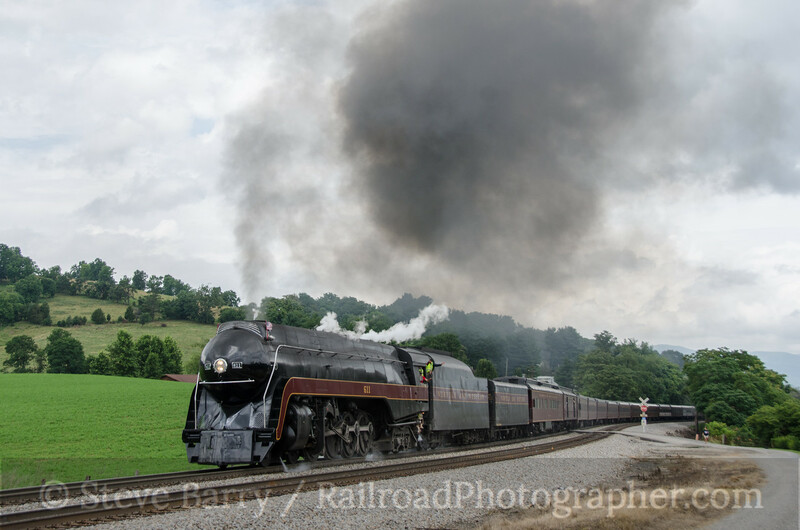 Once again, the train would be battling bad sun on the way back to Roanoke, so Vicker was the last steam shot of the day. The next morning, July 5, we joined the throng of people on the Blue Ridge Parkway overpass at Bonsack. 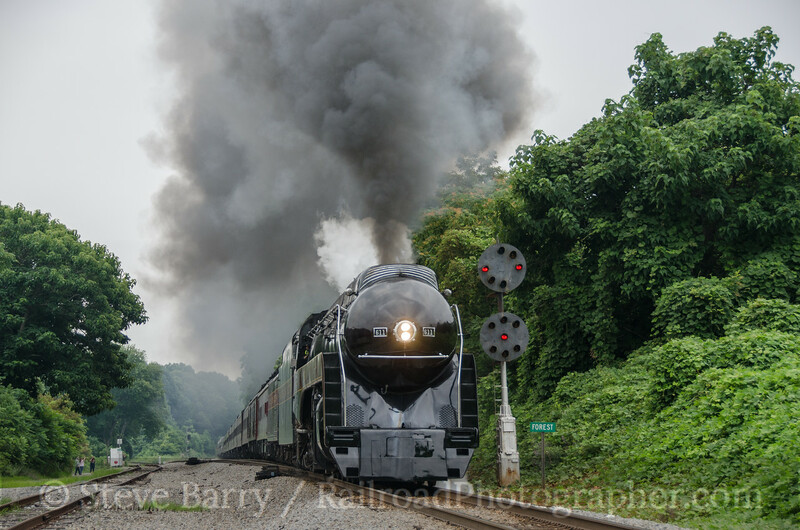 Our last day of 611 started with a fine sight as the train negotiated the S-curve. From here we made an attempt to get greedy by getting ahead of the train at the CPL signals at Villamont. Parking was -- ummmm -- interesting on the one-lane dirt road back into the signals and it did take some time to get everyone untangled once the train went by. Still, the shot was worth it. There wasn't much one could do with the delay in getting out of Villamont, so we headed to Lowry to await the train's return. We had shot off the bridge here two days earlier when the first trip went east -- now we were shooting at ground level as the train went west. Back to the "must do" list -- we left Lowry and headed straight for the CPLs at Webster. That shot appears earlier in this post. 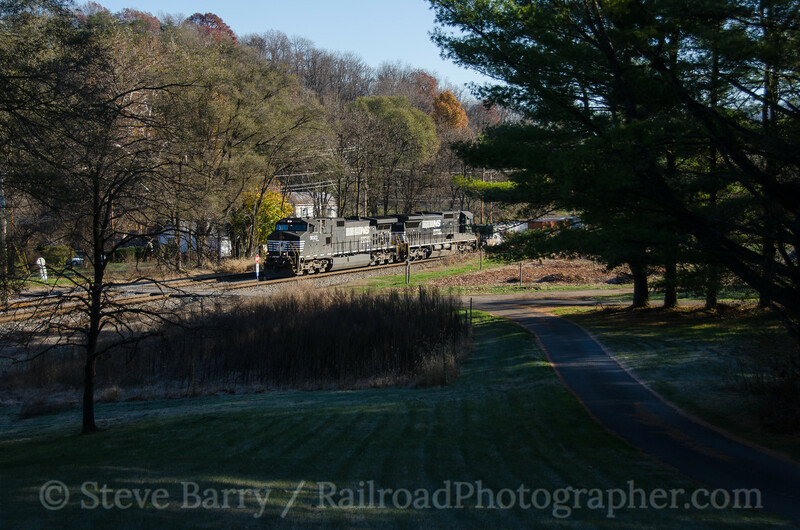 For the afternoon trip to Walton, we paused on the grade up Christiansburg Hill at Wabun to enjoy the sights and sounds of the train working uphill. Another shot at Shawsville followed by another shot at Christiansburg (both photos appear earlier in this post) finished off our westbound chase. 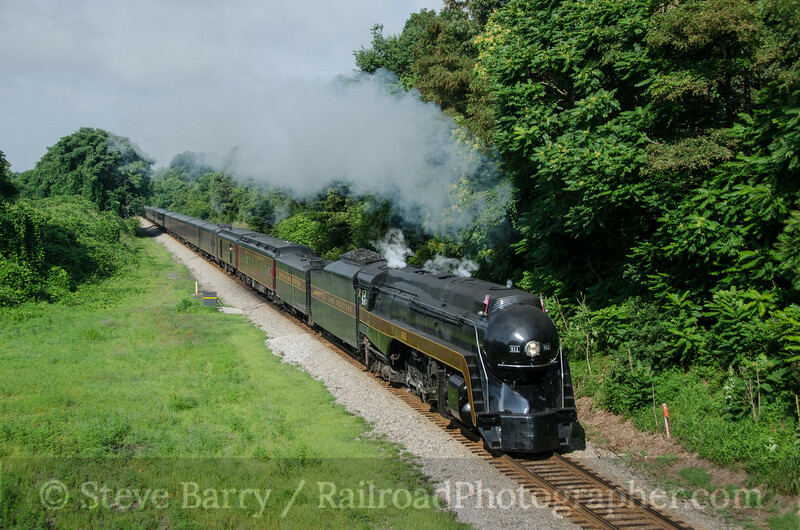 With home beckoning, we set up for one final shot of the eastbound at Vicker, then reluctantly said goodbye to the Norfolk & Western and 611 for the drive back to New Jersey. 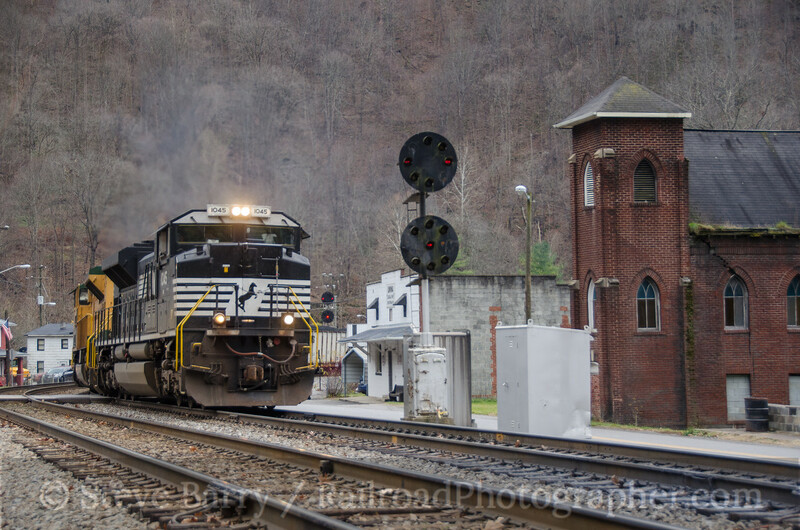 Our journey to Appalachia started with chasing the CSX Santa Train on the former Clinchfield Railroad, then took us to the coal fields of West Virginia on Norfolk Southern's former Norfolk & Western mainline. 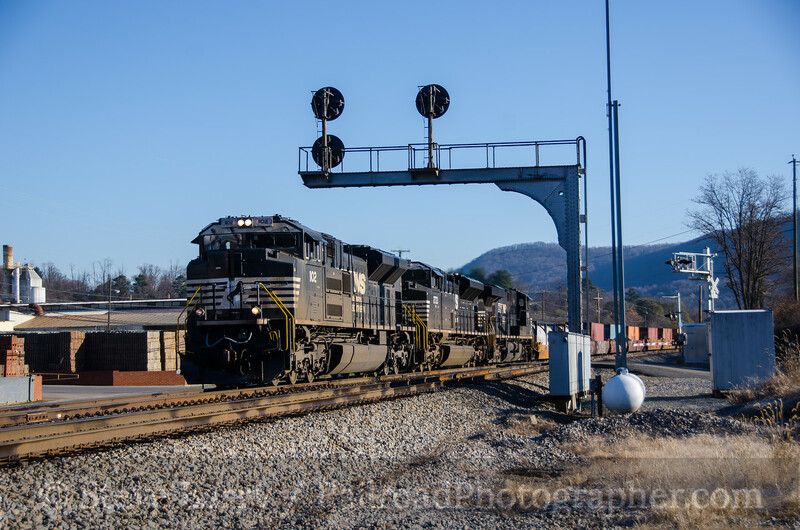 Staying with a Norfolk & Western theme, the final day of the trip, November 24, 2015, kept us on the N&W's coal artery to tidewater, this time east of Roanoke where the line climbs up Blue Ridge summit before heading to Norfolk. 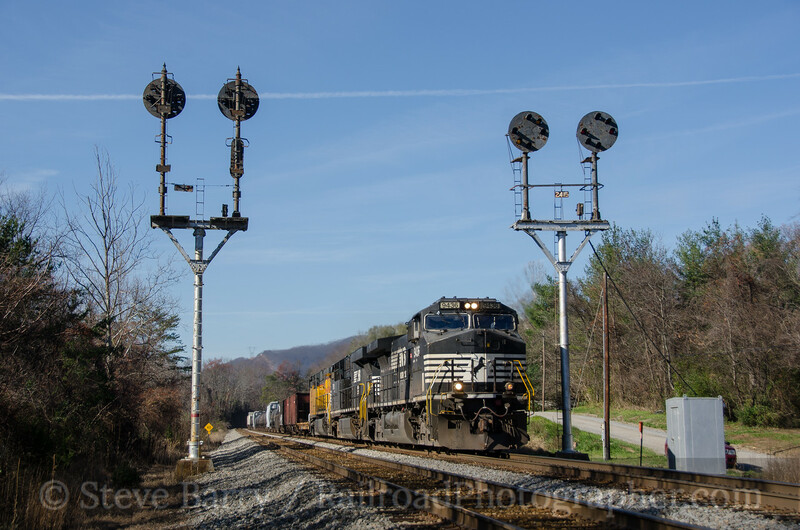 While much of the former N&W is seeing its color position light (CPL) signals replaced as railroads adopt Positive Train Control, the railroad east of Roanoke still retains many of the old signals. How long they will last is unknown, as Amtrak is looking to extend its New York-to-Lynchburg train to Roanoke, which will require installation of PTC on this part of the N&W. The NS mainline can be viewed on ATCS Monitor -- telemetry is sent from switches and signals along the line to the dispatchers' office to show dispatchers which way the switches are thrown and what the signals are displaying. This telemetry can also be picked up by the ATCS Monitor program and a pseudo-dispatcher display can be seen on a laptop computer. This allows one to see if there are any trains anywhere between Christiansburg (west of Roanoke) all the way to east of Lynchburg, and if trains are out there it displays which way they are heading. ATCS showed us we'd have a westbound train first, and, with CPL signals as our primary photo prop, we caught it at Villamont (above). The next train on the screen was also a westbound. 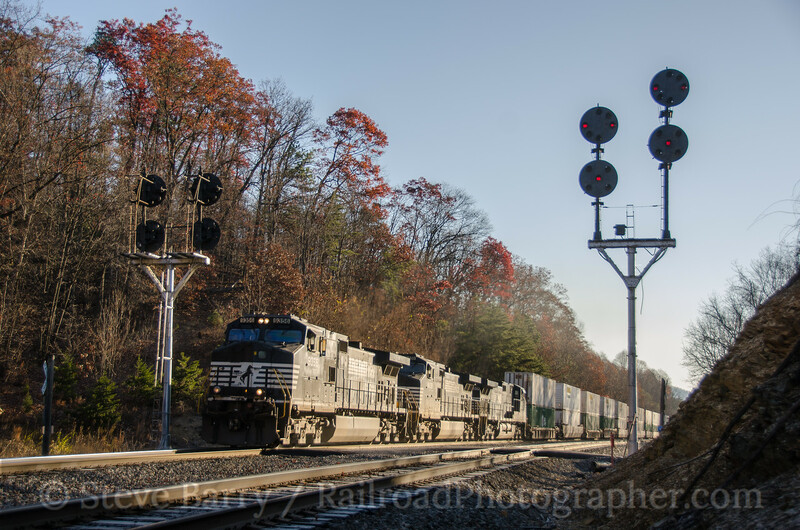 The short winter days and low sun were producing long shadows, so some of the CPL signals we wanted to get were unshootable early in the morning; we settled for the "backside" of the CPLs at Webster for the second train. We really wanted eastbound trains to take advantage of the morning sunlight. But our next train was yet another westbound. We caught this one at Bonsack. 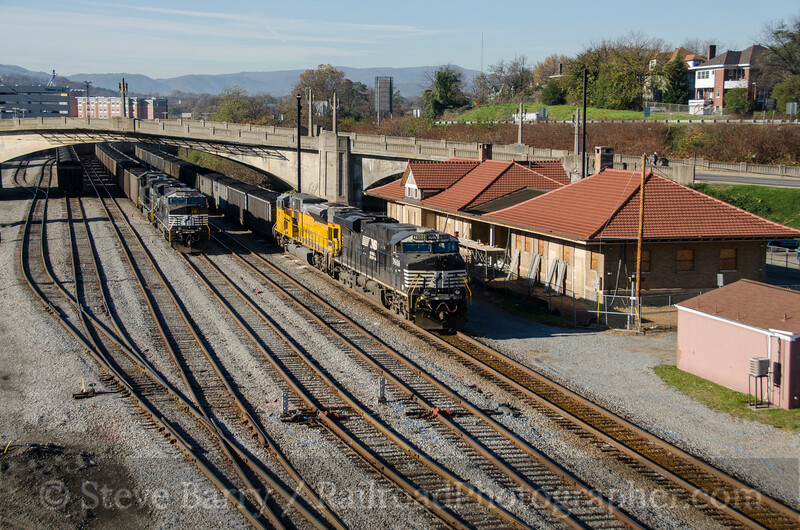 With nothing showing on the ATCS Monitor, we took advantage of the quiet railroad and headed into downtown Roanoke to see what was happening at the former Virginian Railway station in town. 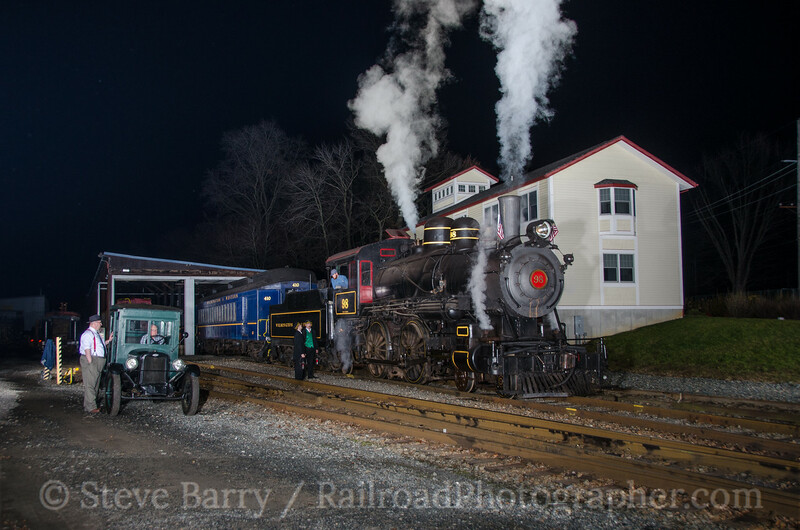 The building is under restoration by the Roanoke Chapter of the National Railway Historical Society. A couple of coal trains were sitting at the station. A lot of the space in this area was at one time taken up by railroads. 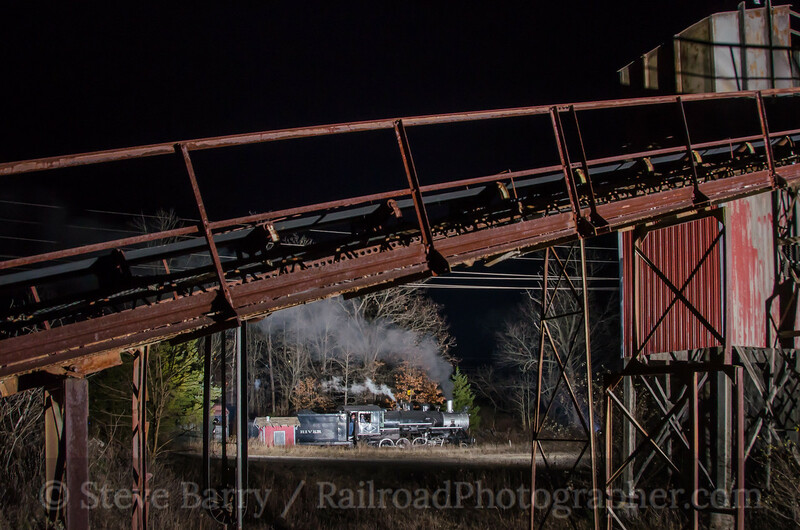 Indeed, a scrap yard was located near here that had four former Norfolk & Western steam locomotives residing in it well into the 21st century. A lot of the tracks -- and the scrapyard -- are now gone, replaced by an expanding medical center. 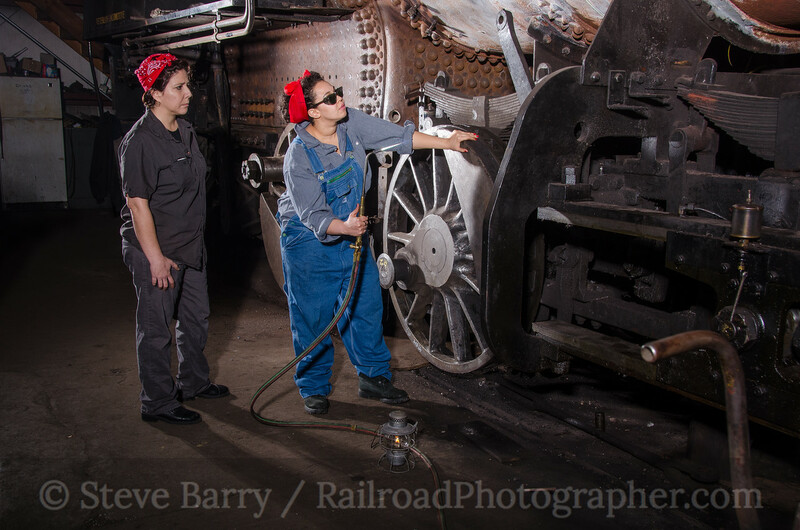 Fortunately, all four of the N&W steam locomotives found new homes where they can be cosmetically restored. Only one remains in Roanoke, however. We had fought a bit of traffic getting into town, so we decided to leave town and head back east by way of the Blue Ridge Parkway, which had an entrance close by. Getting to the Parkway involved going up Mill Mountain, home of Roanoke's famous giant star that looks down on the city. 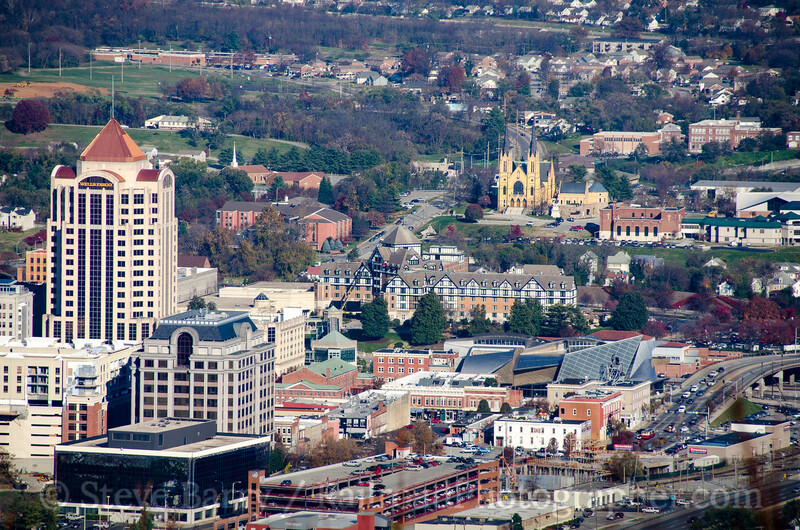 We briefly stopped at the star to observe downtown; the Hotel Roanoke, once owned by the N&W, is in the center of the scene. Finally we had trains showing up again on ATCS Monitor, and the sun was still good for those elusive eastbounds. The Blue Ridge Parkway dumped us off on U.S. 460 near Webster and we continued east from there. We got our first eastbound train splitting the CPL signals at Montvale. The shadows were retreating from the tracks as the midday sun got higher. As the sun swung around to the west we headed back to the signals at the west end of the crossovers at Webster and got a train with a Union Pacific locomotive on the point. The day was growing short and the trains were getting scarce again. With one more westbound on the computer, we headed east into downtown Bedford to get it passing the CPL signals there. 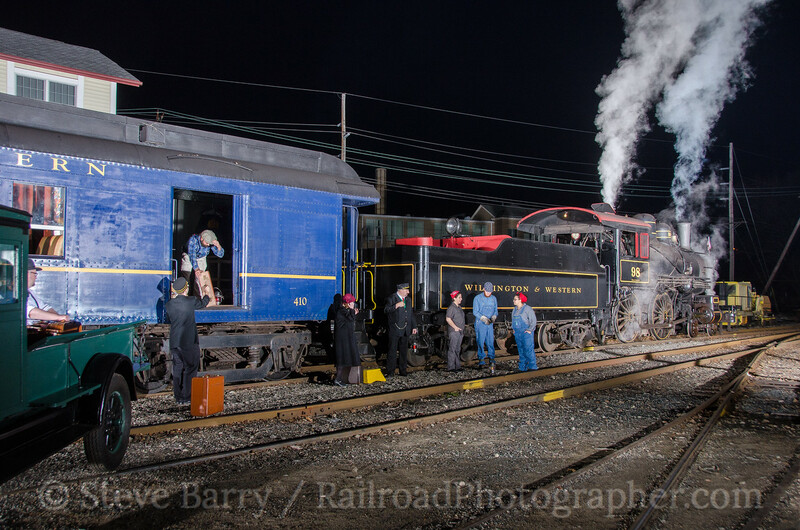 We wanted to be in Staunton, Va., by sunset and it looked like no trains would get to us on the N&W before we had to make our break. It was time to head north. 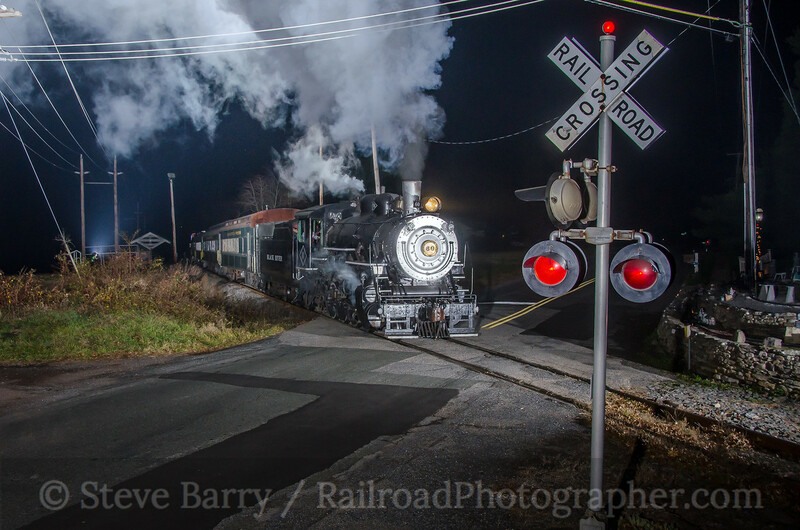 With changes happening all over the U.S., especially when it comes to older railroad signals, there's no telling what the former Norfolk & Western will look like when we get back down here again. 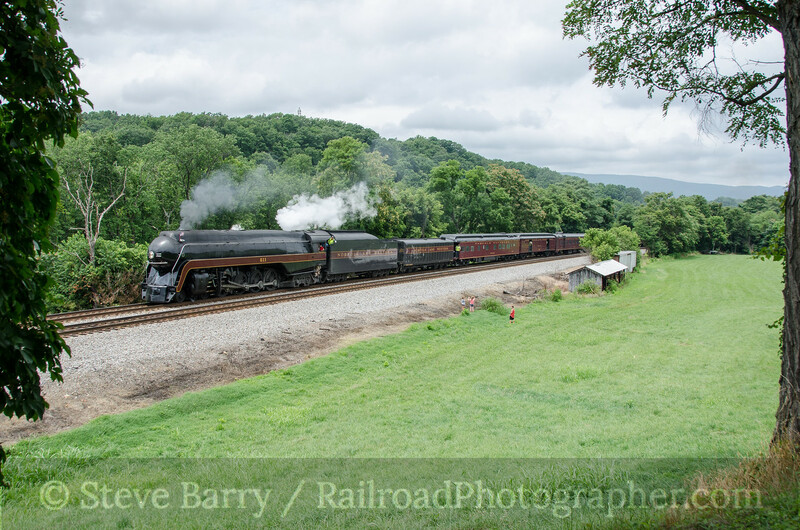 But back in July, these old sentinels saw a familiar face, as former Norfolk & Western J-Class steam locomotive No. 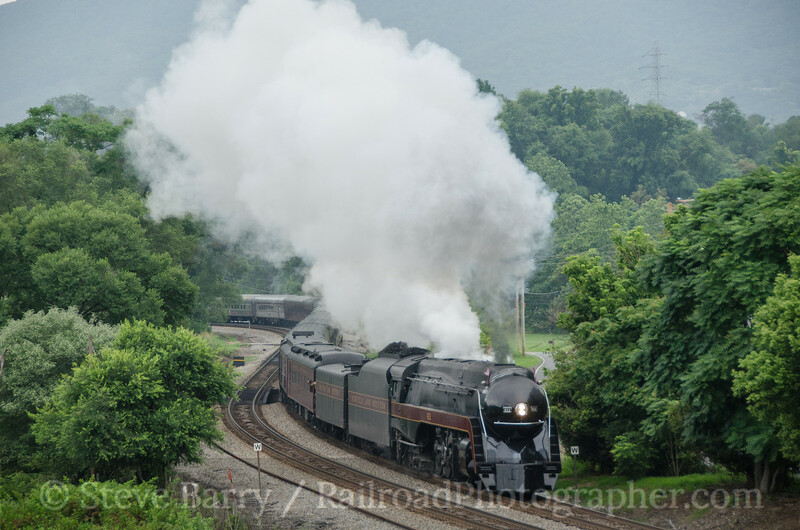 611 went past them on a series of excursions. We'll look back at those trips in our next post.